After realizing that the Canon 1D MKIII was a little too much for my wallet to chew, a good compromise looked like a Canon 40D and some new lenses to cope with the 1.6x crop factor on the new sensor.� The Canon 35 F/2.0 was a major workhorse for me, accounting for probably 40,000 photos taken at National Racquetball events.� Through some research on Fred Miranda, I quickly noticed the 1.4’s benefits of faster USM, sharper photos, and of course an extra stop of light (extremely crucial for low-light sports – like racquetball). I quickly sold the 2.0 to a colleague, and turned to a “WTB” ad on craigslist to find a primo copy of the 1.4 locally.� Within about 5 mintues of posting the ad, I had a reply from a local photographer wanting to sell his mint copy at the right price.� Needless to say, this lens didn’t dissapoint.� Solid metal construction, tack sharp photos, and wonderful contrast have turned this into one of my favorite Canon primes. 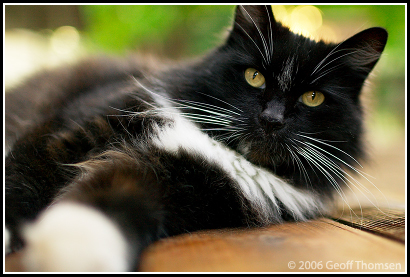 My newest subject makes his modeling debut.� Mooch (named by our 3-year-old) was a skinny little cat who we started to feed.� Now he’s fat, and he’s ours :)� Or maybe, now we’re his. 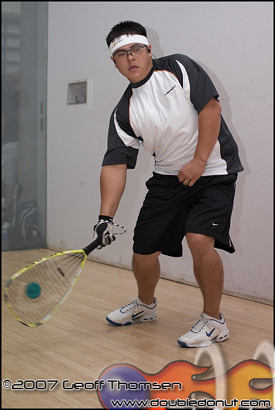 I’ve had a vision in my head for a LONG time about a particular shot I want to capture for racquetball photography.� I’d like to compose a tight shot of a player, with the ball clearly visible – and fully compressed against the racquet strings. Past searches on the internet have yielded electronics kits which had to be assembled; the end result only solving a portion of my problem (light or sound trigger with no interface to a standard photography strobe).� I don’t ming a little hacking, but the parts alone were near $100 – with no guarantee I’d ever be able to get it working without a serious investment in time. Then I discovered the Make� Magazine High Speed Photography Kit!� A fully designed solution which could trigger via sound or light, and could easily interface to a standard compact flash (like my Canon 550EX). After some experimenting with the sound trigger and the connection to my flash (via some $25 eBay wireless remotes), I was ready to capture some action.� Off to the garage, I setup the equipment and started taking test shots (like an idiot, I chose to use a black racquetball which is not easy to see). 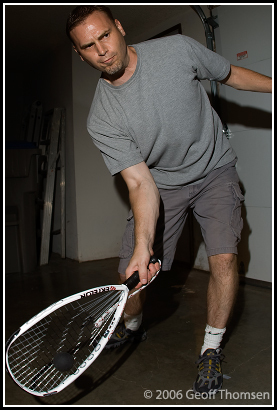 My only problem is that in each photo, the ball is just off the racquet strings.� My theory on this is that the loud sound made when hitting the ball is actually the ball flattening and “snapping” back to shape, not the actual ball hitting the strings.� No matter the sensativity setting, I could never get the flash to fire early enough. My next test will be a carefully placed ball with a light trigger ($12 Fry’s laser pointer now in hand). 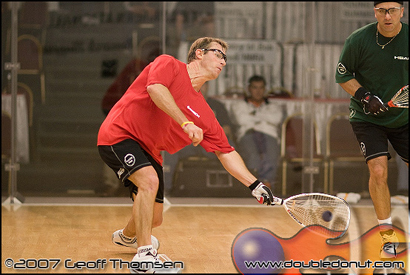 While shooting the 2008 USA Racquetball National Doubles Championships and the 2008 US OPEN, I somewhat accomplished the feat through another method – good ol’ fashioned timing! These shots turned out *ok*, but my goal is to find a way to get these results repeatably, so I can stage the composition and lighting exactly how I want it. You are currently browsing the flatchicken.com blog archives for August, 2007.